Our Mile-High OREO Pie isn't really a mile high (or tall). But it really does have super-sized chocolate flavor! Preheat oven to 350°F. Prepare brownie mix as directed on package. Pour into greased 9-inch pie plate. Bake 35 minutes or until toothpick inserted in center comes out clean. Cool completely on wire rack. Scoop out center of brownie with spoon, leaving a 1-inch crust around edge and thin layer of brownie on bottom. Reserve removed brownie pieces. Pour milk into large bowl. Add dry pudding mixes. Beat with wire whisk 2 minutes. (Mixture will be thick.) Stir in half of the whipped topping and all but 1/4 cup of the reserved brownie pieces. 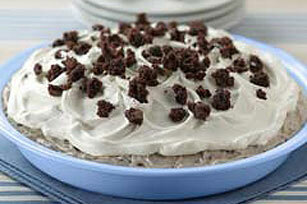 Spoon into brownie crust; top with remaining whipped topping and remaining brownie pieces. Refrigerate 2 hours or until set. Store leftover dessert in refrigerator. If using a 13x9-inch-pan-size brownie mix, prepare batter as directed on package. Pour half of the batter into pie plate. Pour remaining batter into 8-inch square baking dish. Bake at 350°F for 35 minutes or until wooden toothpick inserted in centers comes out clean. Cool completely. Use round brownie as directed in recipe. Cover and reserve square baked brownie for snacking or another use.